This post is sponsored by Royal Canin® and the BlogPaws® Pet Influencer Network™ . I am being compensated for helping spread the word about Royal Canin® and National Take Your Cat to the Vet Day, but Midwestern moms only shares information we feel is relevant to our readers. Royal Canin® is not responsible for the content of this article. Did you know that dog owners are six times more likely than a cat owner to take their dog to the vet this year?! That is why I have partnered with Royal Canin® and taken the Pledge to Take My Cat To The Vet! Did you know that for every five dogs that a vet sees, only one cat is seen?! There are 10 million more cats owned than dogs in the United States! Something is wrong here…. Cats do not communicate like dogs – Dogs will let us know when something is bothering them. Cat’s simply do not. They do not cry or whine like dogs when something hurts. They keep going about cat life. They are good at hiding their pain. Kidney Failure – Did you know that kidney failure is common in cats? Most people do not catch this in their cat until the failure is extreme. Part of a preventative visit is looking for signs of kidney failure. Catching it early will greatly improve your cat’s health. Preventative Care – Like I said before, cat’s just don’t tell us when they don’t feel good or something hurts. When we took Miss Kitty into our home, we made sure the vet seen her. We had no clue she had an ear infection. We caught it in time and she quickly healed up. 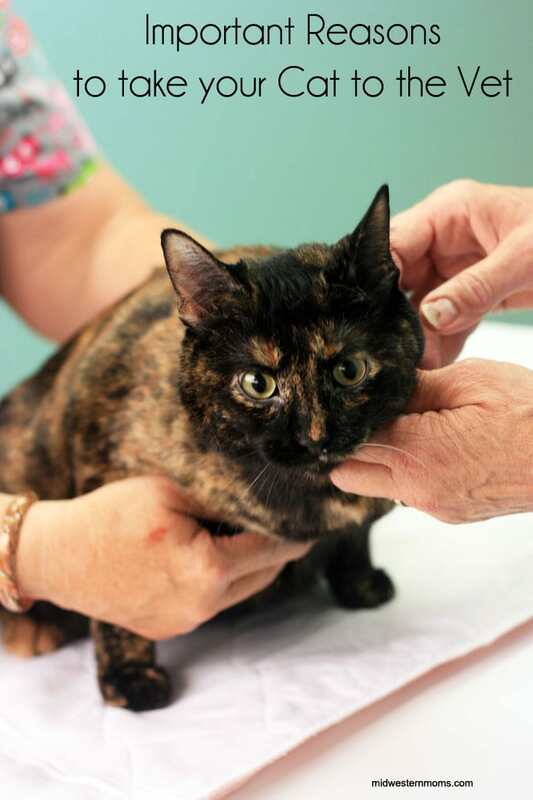 Also, preventative visits are a time to make sure your cat is up on their immunizations. 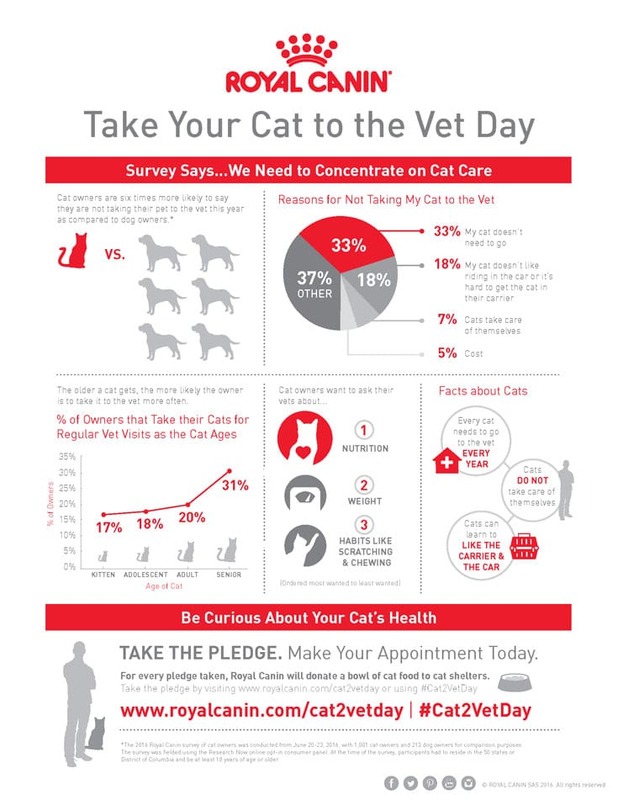 I have taken the Pledge – August 22nd is National Take Your Cat To The Vet Day! I want you to take the Pledge too! As stressful as it can be to take a cat away from it’s home to go the vet, it is extremely important. Here is what I learned from taking Miss Kitty to the vet, just a couple of days ago. Your vet will wash their hands before examining your cat. Smells from other animals can stress your cat out as well. This helps to reduce that stress. Your vet will try to do their best to make your cat as comfortable as they can. Our vet lays out a soft mat on the counter and sprays it with a pheromone that helps calm them down. It is the same pheromone that they use to mark their territory. A good indicator of a cat’s health is their weight. Changes in their weight could indicate something is wrong. Miss Kitty is getting weighed at the vet’s office. 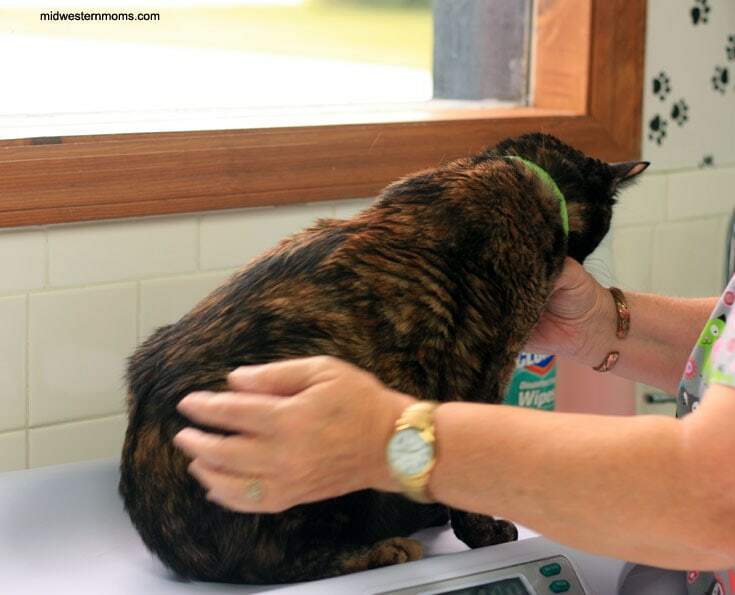 A vet will always check a cat’s eyes, ears, teeth, back, kidneys and temperature. A slightly elevated temperature isn’t always an indicator of sickness. It could mean your cat is just stressed. During Miss Kitty’s visit, we learned that she has some pain in her back. We had no clue! This goes back to cat’s don’t communicate when something is bothering them. It could have gotten a lot worse before we knew anything was wrong. So by taking the pledge and taking Miss Kitty to the vet, “Curiosity Saved the Cat”. Now I want you to take the Pledge and scratch your name on the list and take your cat to the vet. For every pledge taken through August 26, 2016, Royal Canin® will donate a bowl of food to animal shelters across the country! For more information, visit Royal Canin® website. Cute cat! I am so glad you pledged to take your cat to the vet and you took her… I am glad they figured out she was hurting so that you can treat her now. Poor kitty! Very interesting. I really don’t hear people taking cats for vet visits so much. They are a big part of family too. Good idea for preventive care. Miss Kitty is a beautiful cat too! my cat is ill ……her back legs are not working well ..she is facing difficulty to walk .. she is going to give birth to her babies in 2 weeks ..can u tell what would be reason ….. either reason is her pragnency or it would be any infection . You need to take your cat to a vet to see what is wrong.